For Deep Economy book group: enter your reading homework for these three questions here (remember to enter useful comments on your topic page, as well). 1. The last half of Bill McKibben’s book, Deep Economy, seems to relate well with one of the other books discussed in class. During our round robin for book groups we learned about the book Thinking in Systems, and it is this that I found the correlating themes. From what I learned in the discussion, Thinking in Systems attempts to get the reader to noticed all the systems in life and take note of the components that make them continue. 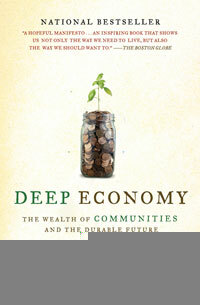 In Deep Economy, McKibben also asks the reader to view our way of life as a system and to examine its processing parts. He focuses mainly on economy. Most of the second half of his book reiterates the points made in the beginning of the book about investing locally, especially community involvement and agriculture. He argues that our current system is unsustainable and that we must fix the damaging parts of it. Our over consumption and depletion of fossil fuels are the main culprits. We get too much of our goods, that could be produced locally and more efficiently, from far away places which hurts more than helps. It would help if we took the premise of Thinking in Systems and applied it to our current economy and social philosophy. We could examine all the components that operate the system and maybe the majority of people in our society would see all the practices that are hurting the planet in order to feed our desire to over consume. i.	Wal-Mart is an evil corporation. I doubt that Mr. McKibben wrote this book solely to demonize the company, but Wal-Mart is brought up many times and seems to signify what is wrong with today’s society. It business model of demolishing all competitors and taking over communities around the world shows what our over consumption can create. In fact, one of the positive examples mentioned in the book describes the community of Powell, Wyoming boycotting the new Wal-Mart that was built. To make sure it didn’t thrive, the residents invested together in opening a bargain-clothing store that competed with the chains low prices. ii. Focusing on expanding the economy quickly for struggling or developing nations may not be the answer. McKibben gives examples of different examples of the struggles faced with nations that focus too much on economic growth and not enough on societies’ needs. Several communities in China are big examples. There is one were the focus is on how much output can be produced but there is no meat and very few proteins available. He discusses how communities like this are increases as production increases throughout several major nations. iii. Making environmental responsibility cool may be a solution for many problems. This was a subtle point made in the book but I feel it is one of the most important. Mckibben describes how certain European nations are promoting environmental awareness simply by making it look good and making ignorance costly. In the Netherlands, bicycle riding is becoming ever more popular as opposed to driving cars. Many of these cyclist can easy afford nice cars but they choose to be more responsible and lower their carbon footprint. Also, in the UK, there are fees for simply driving. We have those in the US but they are used for paying for the roads we use. The UK is doing so in order to persuade motorists to lessen the amount they drive to ease up traffic and cut pollution. 3. The question I bring up for discussion is What can politicians, celebrities, and everyday citizens due to make environmental activities cool? How can we get kids and teens that watch Mtv and are constantly on Facebook all day thinking that being environmentally responsible is that their PEERS will admire? 1)	Currently, our society is under the impression that “more equals better.” In the first chapter of Deep Economy, Bill McKibben states that there are many concerns with our view on growth; the most obvious being “growth is no longer making us happy.” In that same idea of increase in growth is equivalent to a better world, it is assumed that the “better” equals happier. This progression in growth is using up the Earth’s resources, which come at a limited supply. If we are (over) consuming these resources in order to build up our homes, our communities, and our country thinking it will makes us happier, it is all in vain. The example used in the second chapter is agriculture. McKibben talks about how we went from a country of many small, established, and efficient farms to a place where there are just a few large companies insufficiently distributing America’s crops. He mentions that farms used to be primarily family owned but presently “Wal-mart is the largest seller of food in this country (and this planet).” This an example of how are country is trying to achieve more production with less cost, equaling bigger profit. Because of companies, like Wal-mart, having this agenda of more growth for less, America’s farmers are vanishing. The main issue of this modern form of agriculture is that it puts many middle class Americans in the poor house at the expense of a vast amount of fossil fuels and natural resources. Therefore, we are stripping the Earth at an accelerated rate and we are less happy in the end. The main connection I made between the reading and the class discussion is with one the graph of Economy, Society, and Environment. The graphed illustrated that there is more attention put on the state of the economy than the state of society and the state of the planet combined (the portion of the planet being the smallest of the three). ii. The solution to the problem of the destruction of our planet may be right next door. By shopping locally and supporting independently owned farms, you help the income of the middle class, use up less fossil fuel, and usually eat healthier. iii. Small IS beautiful. This goes with the first point. With smaller systems of production, there is more focus on quality. With the larger companies, it is difficult to quality check their entire facilities, which are mainly operated by a large amount of machinery instead of actual people. 3)	The question I want to provoke for the other readers is: What would be the disadvantages to America going back to small independently owned farms and not relying on big corporations for food? 1) On the subject of coffee, I used to work in a coffee shop where half of their inventory was marked ‘Fair Trade’. The Fair Trade Organization is an international agreement of fair wages given to Third World Countries, specifically avoiding that kind of ratio described on page 193, where a cup of Starbucks Coffee cost 25 times more than the Ugandan farmer received for an ENTIRE KILO. 2) a. Judging the amount of carbon emissions we (American’s) produce, and the striking inequalities in pay, we owe Third World Countries approximately $73 billion annually. b. In the Indian state of Kerala, per capita income is about $3 a day. However, literacy rates approach 100%, the amount of post-graduate degrees per-capita is higher than the US and the rate of newspaper readership is the highest on earth. 3) How well do you think the equivalent of a bicimolino used for energy production would catch on in the US (muscle-powered energy)? 1) It mentions on page166 that artists are starting to rely more on concert sales than record sales. This is an age-old model of a musicians career. Some of my favorite bands follow this model. It seems fairer to the rest of the world that they base a career their career on actually playing music instead of cashing in on a track that hits #1 for three weeks. 2) a. Local currency is a very good way to stimulate local economies and communities over the global economy. b. Priority bus systems have been built in China and Brazil, which rapidly decrease the amount of cars being driven and strengthened their communities. c. Vermont Family Forests preserve National Forests by buying acreage and re-selling it to local residents in shares. When logging is needed, the organization follows strict environmental requirements. 3) What would it take to establish a local currency for Santa Cruz county? 4) A local currency could sever as an insulation of security for the prosperity of eco-villages. 1- Korten is right on in this chapter. i took a class last spring that dealt with semiotics, or the analysis of symbols, specifically in pop-culture. When he goes into the marketing schemes that try to sell the idea of gaining friends through the buying of a product, i thought “yeah” that is what the scoundrels are doing. also, on p. 100 where he describes the social experiment of the giving-unto-the-first-year-graduate-students-of-various-disciplines-a-sum-of-money-with-which-to-divide-between-a-public-and-a-private-account-to-in-the-end-take-their-private-account-and-a-percentage-of-the-public-account, it seemed very much like the thought experiment called The Prisoner’s Delemia, which is a more modern argument/justification (after Hobbess’ Leviathan) for a Social Contract theory of ethics. Basically, it rests on the assumption that the most logical thing to do in a given situation is to look out for one’s own interests first, becuase other’s being rational agents, will obviously make the same choices and jepordize you. this is what our system professes. yes, it is bs, but it seems so deeply internalized that often times it is validated by experiences. 1) I have always felt that our culture carries a certain degree of unhealthiness through isolation. Growing up observing endless advertisements and huge places that people who don’t know each other go, to purchase things they don’t need has never seemed right. 3. What level of community do you think would help provide the most functioning and fulfilling life for you and others around you? 4. A local economy is the most basic subtext for a life in an ecovillage. First of all, if you are helping maintain a community garden, the majority of your needs for food are taken care of. Utilities need not be outsourced to independant companies. All basic needs are covered, and the rest is up to the tenants. Whether they choose to buy their kid’s toys at Wal-Mart or make them themselves is their perogative, but the underlying influence is ever-present in their daily lives. – When we were talking last week in class about Cuba, it got me to thinking. A year ago, in a humanities class centered around concepts of sustainability, I began to draw the parallel between the self-destructive state of the world, and my own lifestyle. The example of Cuba being forced to adapt in the Soviet Union’s absence in order to survive correlates metaphoricly (and perhaps vaugely) to my current state. Sickness dictates taking care of myself. e)as far as yeild per acre goes…smaller farms produce more. -What can be done to elimante Taher? Does anyone know if they are deserving of this throught their practices? Do you think such a movement could gather enough support on campus?